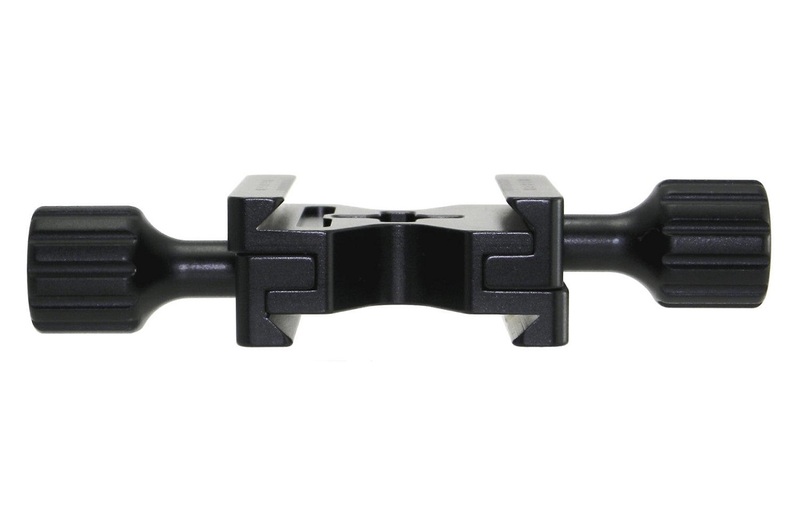 Desmond succeeded to surprise me once again, with the introduction of a Dual Subtend Quick Release Clamp at the weight and price of a common single QR clamp. Desmond DBC-50 is a dual subtend clamp featuring two individually regulated opposing jaws, that promise compatibility with virtually any Arca-Swiss® compatible rail or plate combination clamped over and under. DBC-50 comes in the common to all Desmond clamps and rails, small, plain, white box with a model and code sticker. The QR clamp travels within a zip-lock nylon bag and is accompanied by a good quality 3/8"-16 to 1/4"-20 reducer bushing. The all new Desmond DBC-50 Dual Subtend clamp follows the lately adopted clamp design by Desmond. The clamp is made totally out of Aluminium with no rubber parts. Its major design characteristic is two V shaped openings on the sides taking care of safety-screws, instead of the usual relief grooves, which also play a major role in the weight decrease. Both upper and lower clamp jaws feature laser engraved decimal scales with short lines in 1mm increments. Longer lines with digits are set in 5mm increments. Zero (0) defines the center of the clamp and numbering increases from the center, outwards. The 33mm long, captive screw knobs are of one piece design, with a grooved surface for good handling. Although the nature of this clamp does not call for a center hole, there is one in the center which is also threaded 3/8"-16. The hole is countersunk on the top surface while it sports crossed alignment grooves on the bottom surface, thus making possible to mount the clamp on almost any ball head. The moving jaw tongues are classic in design, from end to end, letting a small glimpse of the push-back springs when opened fully. The jaws open and close smoothly due to very small tolerances and use of thick silicone-grease lubrication. Although the clamps are of different nature and function, a direct comparison between the DBC-50 and the DAC-X1 shows a common design origin. Due to the dual jaw guiding tongues, it was not possible to follow the fully DAC-X1 skeletal design. However, jaw geometry and the safety screw openings remain there to signify that both belong to the same family. Despite the double jaws, the clamp can also be mounted on a ball head. Depending on the ball head design it can be mounted on top of a ball head stem either using a pass through M6 or 1/4"-20 screw or by screwing it directly on a 3/8" or an 1/4" stud (via the provided conversion bushing). When the ball head ball-stem is equipped with anti-twist bosses and a threaded hole like the Triopo RS-3 ball head pictured in the above illustration, the DBC-50 may be attached using an M6 or an 1/4"-20 flat head screw with a hex socket and then just tightened with a 4mm Allen hex key. On the other hand when the ball stem ends in a 3/8"-16 stud, as with the Desmond DBH ball head pictured above, we need simply to screw-on the DBC-50 utilizing the 3/8"-16 threads in its center hole. Needless to say that the ball has to be locked very tightly in order to deliver the appropriate resistance for tightening the QR clamp on top of the stud. In lack of anti-twist bosses, it would be advisable to use one drop of medium (blue) thread lock compound on the stud. Using with Arca compatible Rails. Nevertheless, the real purpose of a Dual Subtend Clamp is to facilitate clamping and adjusting Arca Rails over and under. In this respect the DBC-50 comes to complement the Desmond DLR-2502B (preview) Multipurpose rail and the DAC-25 QR clamp (under evaluation) in formatting a Long Lens Support Bracket. Desmond DLR-2502B Multipurpose Rail combined with DAC-25 small QR Clamp and DBC-50 Dual Subtend Clamp. The DBC-50 facilitates the fore-aft adjustment of a Long lens equipped with a long Arca style Lens Plate on its collar foot (like the Desmond DPL-100 illustrated above). 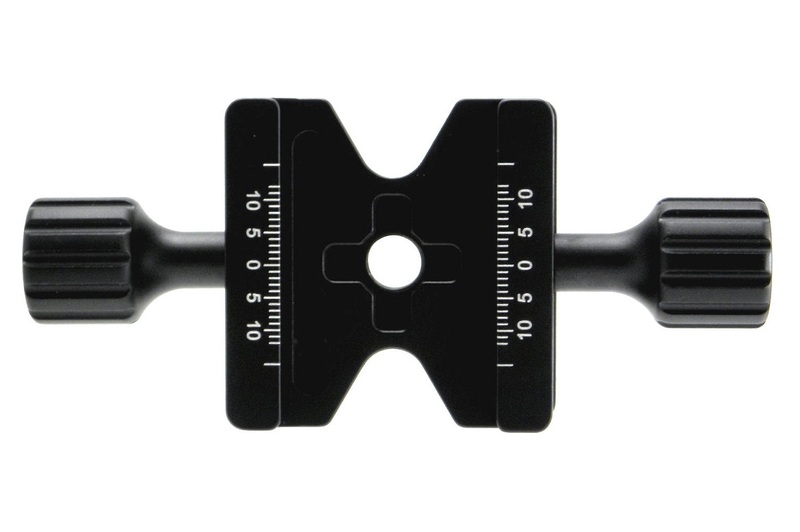 The upper jaws clamp on the Lens Plate while the bottom jaws clamp on the long multipurpose rail. Thanks to its independent clamps, the DBC-50 is compatible with any width / height difference of dovetail may exist between upper and lower rails . With the addition of a Yoke like the Sunwayfoto YLS-01 (Review) shown above we have a fully adjustable Long Lens Support Barcket holding the Canon EF 100-400 L IS USM zoom lens. 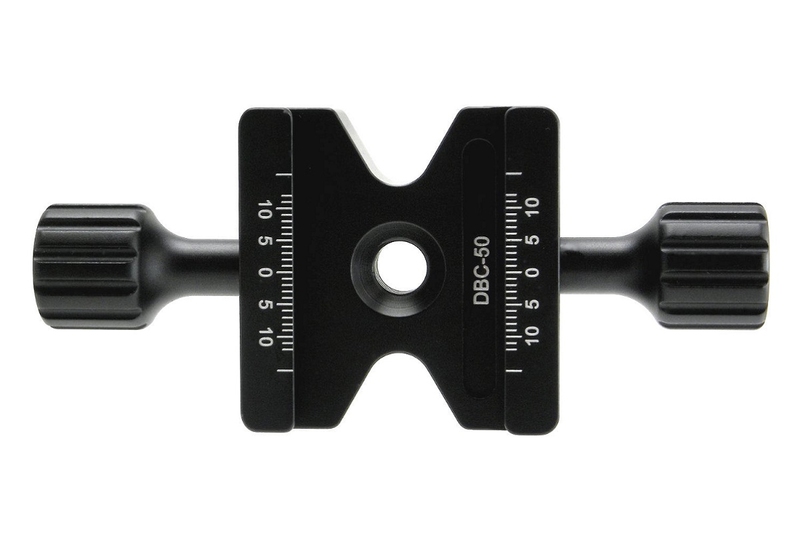 The DBC-50 quick release clamp was tested with various camera plates and lens plates, as well as with multipurpose long rails of various thicknesses and widths. Plates / Rails tested were from Benro, Desmond, Kiwi Fotos, Fotoporo, Marumi and Hejnar PHOTO, without any issue whatsoever. For the readers that like numbers, I hereunder quote detailed measurements of the clamp Jaw dimensions, so as they can decide whether this clamp is compatible with the dimensions of their plates or rails. Top and Bottom jaw dimensions fall within average. Dimensions of both Top and Bottom jaws fall within the average limits, consisting the clamp compatible with all variations of Arca-Swiss® type plates and rails. Low weight for the clamp size and nature. Very good machining, finishing and anodizing quality for the price. Very good fitting with very small tolerances and smooth operation. Good quality metal 3/8"-16 to 1/4"-20 conversion bushing included. I believe this clamp is a very good machining example and considering the proven by now Desmond quality standards, combined with a very low price tag, I can recommend it as an excellent Value for Money ! Note : The DBC-50 Dual Subtend Quick Release Clamp presented in the comparison and usage illustration of this article is a pre-production prototype, kindly offered by Desmond Photographic Distribution, USA, for evaluation and review. Therefore it is missing the laser engravings present in the production model, shown in the beginning. Photos ©2014 S.C.Vlachos and ­Desmond Photographic Dist.